In September 2016, Nuffield Council on Bioethics presented Genome editing: an ethical review. The summary below is written by Jessica Cussins and is originally published here. Reposted with the author’s permission. The UK Nuffield Council on Bioethics’ recently released report, Genome Editing: an ethical review (full version available here) is the most substantial and thorough assessment of its kind. 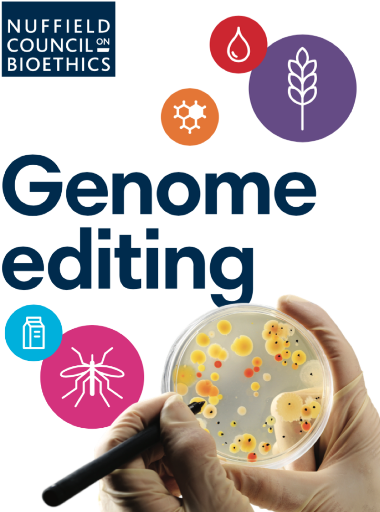 It delves deeply into the ethical, social, and political underpinnings and implications of genome editing, and touches on related, converging technologies including synthetic biology, gene drives, and de-extinction. A second report with ethical guidance regarding the use of genome editing for human reproduction is due in early 2017 from a Council working group chaired by Karen Yeung. This first report will be an important reference for people across disciplines for some time, and I will not do justice to its scope and breadth here. However, I want to draw attention to just seven concepts that are particularly helpful and illuminating, as much for their framing of the questions at stake as for their content. I briefly summarize each point, and select key quotes from the report. Contrary to frequent assumptions, innovation in science and technology is neither linear, autonomous, nor pre-destined. It is continuously co-produced in relation to a complex intersection of actors, institutions, market-drivers, and serendipity. Momentum and sunk costs can however encourage adherence to certain technological pathways, meaning the choice of paths we take should not be undertaken blindly, or lightly. Discussion of “genome editing” as opposed to “genetic modification” or “genetic engineering” has a re-framing effect that serves to distinguish the newer technological capabilities as more “precise,” as well as to diminish their consequences by avoiding connotation with such loaded terms as “GMO.” The “editing” metaphor instead conjures images of easily altered language or computer code. “Whether intentionally or not, the ‘editing’ metaphor distinguishes the approach from less ‘precise’ forms of genetic ‘engineering’ and, simultaneously, distances it from their associated connotations, including the range of public responses that these terms typically excite. The editing metaphor also plays on characterisations of the genome as the ‘book of life’ containing ‘sentences’ (genes) made up of a ‘genetic alphabet’ of four ‘letters’ (A, C, G and T, the initial letters of the four chemical bases comprising DNA) that were common around the time of the Human Genome Project. The editing metaphor transfers easily to the more contemporary image of modifying computer code. The metaphor suggests not only the type but also the significance of the intervention: it is technical, is not dependent on scale (as it applies equally to changes large or small) and is seen as corrective or improving (at least in relation to the editor’s vision). Science and technology are intimately connected with the public interest. They are forged through public funding and support, and they act upon and within the world, with impacts on the well-being and welfare of the public. Should we judge what constitutes an acceptable or unacceptable biological intervention using a concept of what is “normal?” What would that mean and who would decide? What lessons must we heed from 20th century eugenics programs about desires to direct humanity? The advantages and opportunities of science and technology in general, and of genome editing in particular, may not be fairly distributed among different groups, different nations, or across generations. Developments cannot therefore be seen outside of the context of social, intergenerational and global justice. Public policy initiatives around genome editing are high-stakes, representing a collective vision of a desirable future, and determining those actions deemed unacceptable to the public interest. Public policy is both reflective of and impactful upon the society in which it functions, and in the world at large. Genome editing is a new development that has garnered enormous excitement. It is important to discuss the impacts of this disruptive new technology, but it will also be useful to avoid inevitability arguments, sky-high expectations, and to remember that it is just one element of a number of larger converging technologies. Future discussions would benefit from beginning with real human challenges or problems, rather than with a technology for its own sake.